These words were superimposed on a beautiful picture, but no ascription was provided. 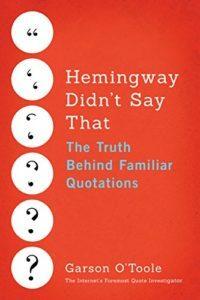 You have examined many quotations with incorrect attributions. There is a comparable problem that is endemic online. Sometimes quotations and images are appropriated without credit; original attributions are erased or cropped out, and new web addresses and logos are added. Would you please trace this saying? Quote Investigator: The statement above was crafted by the computer graphic artist, photographer, and writer Zero Dean in June 2013. He wrote a post on this topic and created a set of vivid images which have been widely shared on social networks such as Facebook, Pinterest, Instagram, Tumblr, and Twitter. However, sometimes Dean’s name has been effaced or replaced by other identifiers. In 2007 Zero Dean was a senior artist at a computer gaming company. He created artwork for games such as Rise of Nations and Red Dead Redemption. In 2009 he left his job and started on an epic road trip adventure. He has shared his experiences via his writings, photography, and art. Not everyone will understand your journey. And that’s fine. You have to realize that it’s not their journey to make sense of. It’s yours.